First lady Melania Trump is brushing aside allegations of infidelity on her husband's part, telling ABC News in an exclusive interview that she has no time for what she calls media speculation and gossip. "I'm a mother and a first lady, and I have much more important things to think about and to do," Trump said in a clip of an interview set to air Friday on "Good Morning America," when she was asked whether President Donald Trump's alleged infidelities have put a strain on their marriage. "It is not concern and focus of mine," she added. 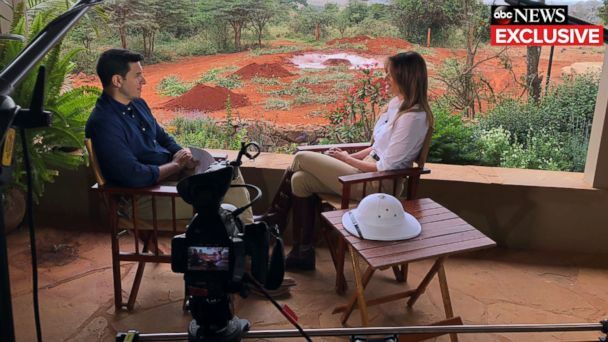 The usually private first lady, who has refrained from responding publicly to repeated allegations of her husband's infidelity, which he's denied, opened up to Chief National Affairs Correspondent Tom Llamas in an exclusive interview during her recent tour through Africa -- her first solo international trip as first lady. Daniels' public assertion came in an attempt to void a nondisclosure agreement and bring attention to a $130,000 hush-money payment the president's lawyer at the time, Michael Cohen, made just weeks before the 2016 presidential election. Donald Trump has since admitted to reimbursing Cohen for the payment, but the president insists the affair itself never took place. In June, the president's personal attorney, Rudy Giuliani, said the first lady "believes her husband, and she knows it's untrue," referring to Melania Trump's thoughts on Stormy Daniels' claims. Despite the public's constant focus on her personal life, the persistent allegations of infidelity and the onslaught of accusations of sexual misconduct against her husband -- accusations the president denies -- the first lady insists their marriage is good and that she loves her husband. "Yes, we are fine," the she said. "It's what media speculate, and it's gossip. It's not always correct stuff." Tune in tonight at 10 p.m. EST for more of the ABC News special "Being Melania -- The First Lady."